Are you planning a conference or retreat? Reserve five or more rooms and use our Dining Parlor as a complimentary venue space. The room rate also includes breakfast for two. You can subtract one for $12 or both for $24. After the first night you will receive 20% each additional night. Call/e-mail with any additional questions. 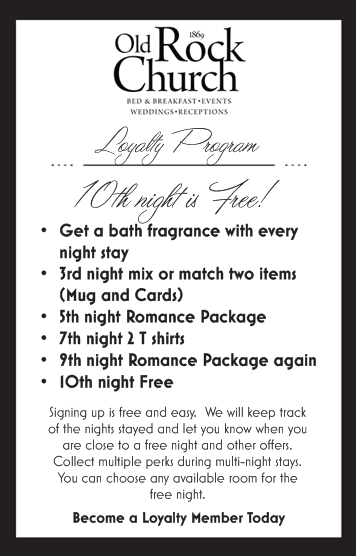 Become a Loyalty Member to receive bonus gifts during your stay! Sign up for free when you check in and mention your membership when you return to earn a Free night stay on your 10th night. At the Old Rock Church we want to give the best value we can to our guests every day of the year. Included in the room rate are two hot breakfasts that you personally order from our menu. You can have your breakfast delivered to your room or you can dine in our parlor. To get a similar breakfast elsewhere you would pay $20-30 plus a tip. If you do not find our breakfast to be an added value then we give our guests an option to exclude breakfast at $12/plate. Our rooms are always the same rate. Queen Rooms $125, King Rooms $150, and King Suites $175 for the first night and 20% off each additional night. There is no need to search different sites and look for coupons because we are always the same price. When the demand is high in Cache County other lodging accommodations will charge $300-400 a night for a basic motel room. By keeping our rates the same all year round we can offer our best price everyday for everyone. We have an all inclusive rate. 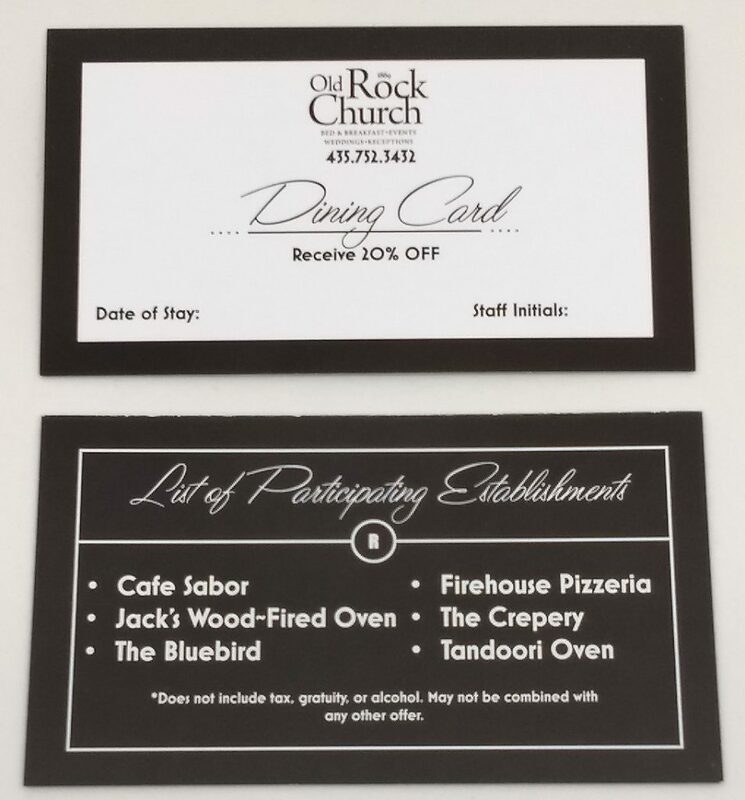 All guests receive a dining card. We have DVD’s that you can take to your room. Hot Chocolate, cookies, and popcorn are all complimentary room service options. Our guest return rate for 2017 was just under 20%. People return based on their perceived value of our rooms. Our Google rating is 4.6 stars, making us tied for the best rated lodging in the valley. The most unique value that we offer is the historic experience found by coming to the 1869 Old Rock Church. Upon arrival you will be given a dining card to receive 20% off some local restaurants. They are listed below with thier address and an overview. Cafe Sabor (600 W Center St ) Mexican bistro located in the former train station. Large portions for the price. Enjoy burritos, tacos, and more. Every table is served fresh chips with hot and mild sauce. Great atmosphere and food. Jack’s Wood~Fired Oven (256 N Main St) You will see your dough tossed and be able to see the pie go in to the wood fired oven. They use all local ingredients to make quality pies that average $12. The Bluebird (19 N Main St) Enjoy old fashioned American food in this 1920’s candy shop. Every table is served fresh rolls. Menu includes Sandwich, chicken, and steak. You can eat an ice cream sundae at the candy bar in front of the old soda fountains. Firehouse Pizzeria (682 S Main St) They serve pizza, salad, and baked pasta. Their menu has a lot of choices and they are known for their 36″ Monster Pizza challenge. They have a lot of specialty pizza’s to choose from. The Crepery (25 W Center St) Boutique restaurant and coffee shop. You can choose from sweet and savory Paris style crepes. Tandoori Oven (720 E 1000 N) Traditional Indian food. They serve a variety of curry’s and naan that are authentic. Many ingredients come from India, and the gas station that is attached to the sit down restaurant also has Indian products for sell. If you like spicy food with a family owned and operated touch you will like Tandoori Oven. The park is just over three blocks east from the Old Rock on Center Street. You can play a challenging round of Disc Golf on the hillside, or walk along Spring Creek through the park. A 15 minute drive from the Old Rock will get you to the top of the 6 mile Providence Canyon road to the rock quarry. Once at the top you can turn west (right) and drive right up to one of the three waterfalls at First Waterfall Hallow. The second waterfall is a few minute hike in Second Waterfall Hallow. The third is found in Box Elder Hallow and takes about 20 minutes to climb to. I recommend a high clearance vehicle; you would need to carefully navigate a car on a fairly rough dirt and rock road. Bring water and snacks, or a picnic as desired. The canyon has Mountain bike and hiking trails. On the north end base of the canyon there is a shooting range. The canyon is ATV friendly and you will most likely see other people on your trek.